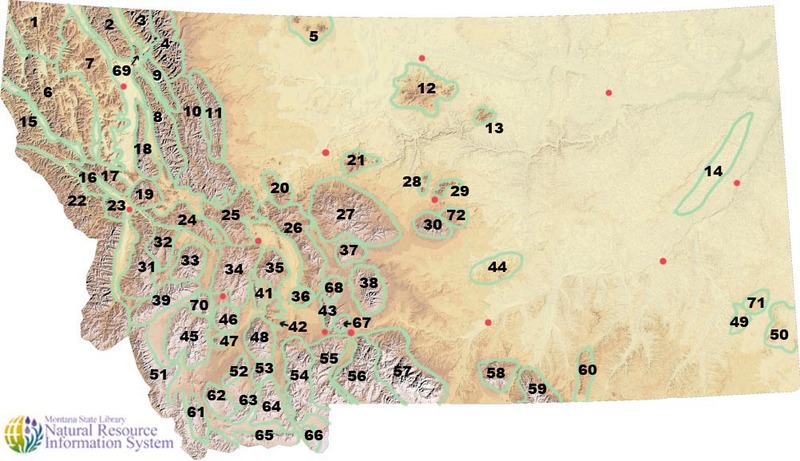 There are no official names or boundaries for Montana mountain groups (ranges) and hills. The closest thing to "official" names are the names for some of the groups and ranges found on USGS topographic quad maps. No boundaries are indicated on these maps. The names here are from USGS maps, or: Ed Madej of the Montana State Library, or Cedron Jones of the Montana Wilderness Association. Because there are no "official" maps and names, the creators of this site took the liberty to break out and name some mountain groups that seemed to be deserving of recognition. Usually this was due to the recognition and naming of otherwise unnamed, apparently distinct entities in some of the local vernacular. These latter names are in the list are enclosed in "quote" marks. Boundaries of groups and ranges shown on individual maps of these areas were drawn using maps generated with Delorme Topo USA (R) software and data. The protocol was to follow as closely as possible the base of the actual mountains but to stay above foothills and alluvial fans. These boundaries were then transferred to a USGS 1:500,000 topographic map for display. The lowest elevations were estimated from the lowest point found along these drawn boundaries. They are meant to be only very rough approximations. The highest elevations for mountain groups were taken from USGS topographic quad maps. The accuracy here depends on how long ago and if they were actually surveyed. Many of these are unnamed.